. God of the Hearth 竈神 Kamadogami and Kappa .
. 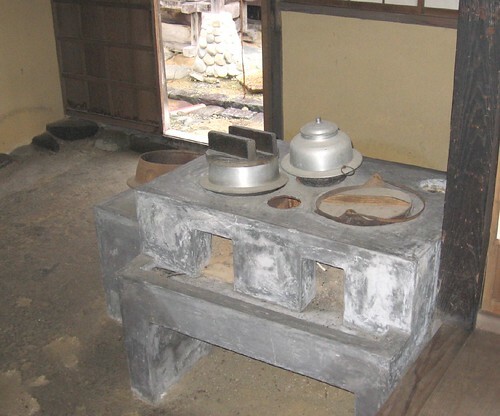 Kitchen (daidokoro) and hearth (kamado) . This Kamagami deity is especially venerated in Miyagi prefecture. Its veneration spread from Miyagi to the south of Iwate, basically the territory of the ancient Sendai domain 仙台藩.
. Kōjin to misaki 荒神とミサキ - Introduction of Misaki Daimyojin 御先大明神 . 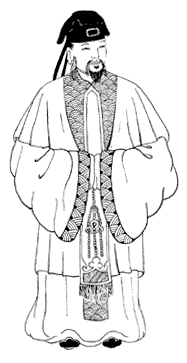 (a deity of the Chinese Onmyodo). Dokujin spend the spring in the hearth, summer at the gate of the home, autumn close to the well and winter in the garden of the estate. If any digging was made during the season when he was dwelling in a special area of the home, there had to be special services to appease him beforehand. Every morning and evening a candle had to be lit for him near the heath. He liked the place to be clean, and the kitchen knives should never be pointed toward the earthen hearth.
. Aragansama, Aragan sama 荒神様 / アラガンサマ "Wild Deity" . Tengosama, Tengu sama テンゴサマ / Tengohan, Tengo han (san) テンゴハン Tengu in the dialect of Toyama. In Buddhism, he is Kenroo chijin 堅牢地神 Kenro Earth Deity.
. Hōkigami 箒神 Hokigami, Hahakigami - the Broom Deity . And its encounter with Kojin Sama. 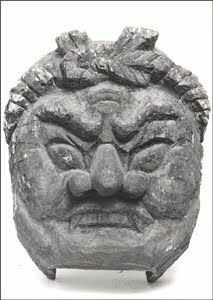 Aragamisama, Koojinsama, Koojin sama 荒神様 Kojin sama, "rough god", "wild deity"
The mask representing Kamagami was made of wood or clay. Fire has been looked at with veneration and fear since olden times and the kitchen hearth has been a special place of worship. Most traditional homes have a shelf for the gods (kamidana) near the hearth (kamado) or open hearth (irori). The mask was also hung at the main strong pillar of the home (daikokubashira), which was often black with sooth from the kitchen fire. This deity helps to prevent fire in the kitchen. "Kamagami is watching over the kitchen, so do not behave in an improper way or he will punish you!" In a survey of 1985 there were about 2.000 pieces found in Miyagi and 400 in Iwate. When modern homes were built, there was no more space for an ancient hearth or shelf for the gods. Some homes keep the mask now in the Tokonoma alcove of the living room. Masks of this kind used to be made by the carpenter who build a house in former times. The eyes are wide open and the teeth show to give it an angry look. This mask is an important cultural property of Shiogama Town. Shiogama town was hit hard by the disaster. is a Shinto shrine located in Dazaifu, Fukuoka prefecture, Japan. Located at the top of Mount Hōman, which has been venerated from ancient times as a sacred mountain, the shrine is dedicated to Tamayori-bime, Emperor Ōjin, and Empress Jingū. The peripheral zone of Mount Hōman, including the shrine, is a National historic site. The shrine was said to have been founded by Emperor Tenji when he built a castle surrounded by water and moved the authority in Dazaifu to the present-day Tofurō Ruins for defensive purposes in 664, due to his defeat in the Battle of Baekgang in August of the previous year. He dedicated the shrine to thousands of gods at Mount Hōman, which faces an unlucky direction. It has two sanctuaries, one at the foot of the mountain and one at its peak. There used to be a third sanctuary midway up the hillside, but only its ruins remains today. The upper sanctuary was founded in honor of Tamayori-bime appearing while the monk Shinren was performing his ascetic training in 683. The shrine is also known for being a great place for cherry blossom viewing in the spring, and many people visit in the autumn to see the fall foliage. The origin of this shrine is not clear. On August 6, 1945, it was about 4.5 km away from the center of the atomic bomb.
. Sake 酒 rice wine for rituals and festivals . In some parts of Iwate the deity of the hearth and kitchen fire is Fudo Myo-O 不動様. He dislikes impure things. If a child pees in the kitchen by accident, mother has to extinguish the fire and throw purifying salt on it. If you do impure things in the kitchen, your mouth will become strangely curved. In the morning before breakfast if you use the vines of wisteria or Kuzu 葛の蔓 to light the fire, the family will become poor. If you burn an old baby basked made from straw (ejiko えじこ, enshiko エンツコ), the child that had been in this basked will die in a fire.
. Legends about Fudo Myo-O 不動明王 .
.　baby basket えじこ ejiko . Literally "rough deity," the Buddhist tutelary Kōjin is usually depicted with six arms and three faces displaying angry expressions, and is known as guardian of the "three treasures" of Buddhism-the Buddha, the Dharma, and the sangha or congregation of monk-priests). Originally, the term "rough kami" (araburukami　あらぶるかみ(荒ぶる神 / 荒振神) was applied to any spiritual being demonstrating awesome power and causing violent apparitions and disasters. Kojiki and Nihongi use both terms araburukami and kōjin to describe kami that did not submit to the rule of the Plain of High Heaven and its emperors. Sanbō Kōjin　三宝荒神　("the fierce deities of the three treasures"), while on the folk level, the deity became related in complex ways to the kami of the home (ie no kami) and community tutelaries, thus producing the general features of the Kōjin seen today. 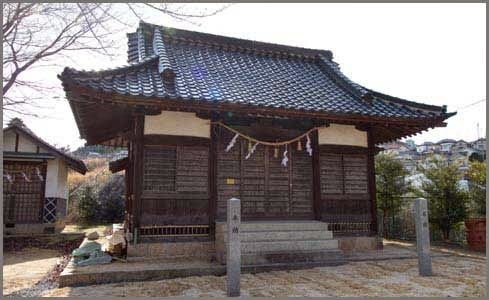 On the folk level, two categories of Kōjin can be found, namely, the Sanbō Kōjin worshiped inside the home, and the Kōjin of land , enshrined outdoors. 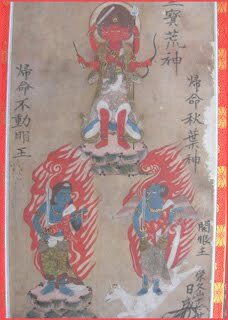 With ancient roots, the folk deity known as the kami of fire (hi no kami　火の神) or kami of the hearth (kamado no kami　竈の神) became linked to the combinatory deity Sanbō Kōjin, likely as the result of influences from Chinese beliefs in hearth tutelaries. Viewed as having a malicious disposition liable and thought of primarily as having the effect of exorcising evil, the deity later came to take on the additional characteristics of an agricultural tutelary. The type of deity represented by the Kōjin of land, on the other hand, demonstrates characteristics found in other common land kami and the kami of mountains (yama no kami　山の神), as well as features of what are called kami of the estate (yashikigami　屋敷神) or clan tutelary (ujigami　氏神), as well as other local communal tutelary kami. A cult centered on the "Ox Kōjin" is also sometimes found devoted to the deity as a tutelary of horses and oxen.
. Sanboo koojin no osamedori 三宝荒神の納鶏 .
. . . CLICK here for Photos of Sanbo Kojin ! One of the things a Kappa water goblin fears it the 荒神 Kojin deity. 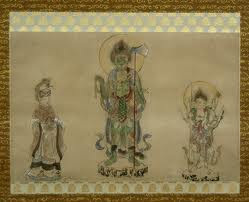 Small children in Kyushu are often smeared black with the ashes of the hearth 荒神墨 to protect them from evil influence. 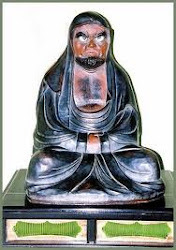 In Kyushu there are many legends where small children were saved from water accidents involving the wicked Kappa, because they were smeared in black with Kojin hearth ash.
. Temple Katsuo-Ji 勝尾寺　(Katsuooji) . In Chinese folk religion and Chinese mythology, the Kitchen god, named Zao Jun or Zao Shen, is the most important of a plethora of Chinese domestic gods that protect the hearth and family. In addition he is celebrated in Vietnamese culture as well. It is believed that on the twenty third day of the twelfth lunar month, just before Chinese New Year he returns to Heaven to report the activities of every household over the past year to the Jade Emperor (Yu Huang). 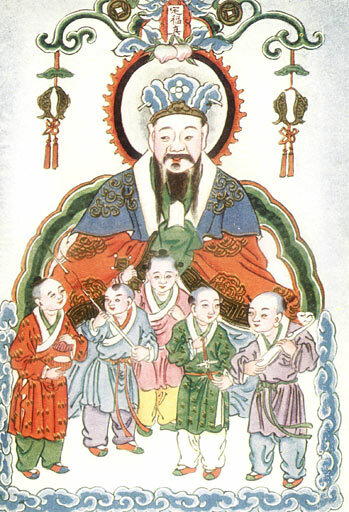 The Jade Emperor, emperor of the heavens, either rewards or punishes a family based on Zao Jun's yearly report. Though there are many stories on how Zao Jun become the Kitchen god, the most popular dates back to around the 2nd Century BC. Zao Jun was originally a mortal man living on earth whose name was Zhang Lang. He eventually became married to a virtuous woman, but ended up falling in love with a younger woman. He left his wife to be with this younger woman and, as punishment for this adulterous act, the heavens afflicted him with ill-fortune. He became blind, and his young lover abandoned him, leaving him to resort to begging to support himself. Once, while begging for alms, he happened across the house of his former wife. Being blind, he did not recognize her. Despite his shoddy treatment of her, she took pity on him and invited him in. She cooked him a fabulous meal and tended to him lovingly; he then related his story to her. As he shared his story, Zhang Lang became overwhelmed with self-pity and the pain of his error and began to weep. Upon hearing him apologize, Zhang's former wife told him to open his eyes and his vision was restored. Recognizing the wife he had abandoned, Zhang felt such shame that he threw himself into the kitchen hearth, not realizing that it was lit. His former wife attempted to save him, but all she managed to salvage was one of his legs. The devoted woman then created a shrine to her former husband above the fireplace, which began Zao Jun's association with the stove in Chinese homes. To this day, a fire poker is sometimes referred to as "Zhang Lang's Leg". Alternatively, there is another tale where Zao Jun was a man so poor he was forced to sell his wife. Years later he unwittingly became a servant in the house of her new husband. Taking pity on him she baked him some cakes into which she had hidden money, but he failed to notice this and sold the cakes for a pittance. When he realized what he had done he took his own life in despair. In both stories Heaven takes pity on Zhang Lang's tragic story. Instead of becoming a vampirish hopping corpse, the usual fate of suicides, he was made the god of the Kitchen, and was reunited with his wife. The origin of the Kitchen god differs. Another possible story of the "Stove god" is believed to have appeared soon after the invention of the brick stove. The Kitchen god was originally believed to have resided in the stove and only later took on human form. During the Han Dynasty, it is believed that a poor farmer named Yin Zifang, was surprised by the Kitchen god who appeared on Lunar New Year as he was cooking his breakfast. Yin Zifang decided to sacrifice his only yellow sheep. In doing so, he became rich and decided that every winter he would sacrifice one yellow sheep in order to display his deep gratitude. Traditionally, every Chinese household would have a paper effigy or a plaque of Zao Jun and his wife (who writes down everything that is said in the household over the year for her husband's report to Jade Emperor) above the fireplace in the kitchen. This tradition is still widely practiced, and Zao Jun was the most highly worshiped god of those who protect the household and family. Offerings of food and incense are made to Zao Jun on his birthday (the third day of the eighth lunar month) and also on the twenty third day of the twelfth lunar month, which marks his return to Heaven to give his New Year's report to the Jade Emperor. On this day, the lips of Zao Jun's paper effigy are often smeared with honey to sweeten his words to Yu Huang (Jade Emperor), or to keep his lips stuck together. After this, the effigy will be burnt and replaced by a new one on New Year's Day. Firecrackers are often lit as well, to speed him on his way to heaven. If the household has a statue or a nameplate of Zao Jun it will be taken down and cleaned on this day for the new year. Many customs are associated with the Kitchen god, especially defining the date of the "Kitchen god festival", also known as "Little New Year". It is noted that the date differed depending on the location. It is believed that people in northern China celebrate it on the twenty-third day of the twelfth lunar month, while the people in southern China celebrate it on the twenty-fourth. Along with location, traditionally the date may also be determined by one's Profession. For example, "feudal officials made their offerings to the Kitchen god on the twenty-third, the common people on the twenty-fourth, and coastal fishing people on the twenty-fifth". In addition, generally it was the males of the household that lead the sacrificial rites. In order to establish a fresh beginning in the New Year, families must be organized both within their family unit, in their home, and around their yard. This custom of a thorough house cleaning and yard cleaning is another popular custom during "Little New Year". It is believed that in order for ghosts and deities to depart to Heaven, both their homes and "persons" must be cleansed. Lastly, the old decorations are taken down, and there are new posters and decorations put up for the following Spring Festival.
. Gozu Tennō (牛頭天王) . Sometimes people fall down unconsciuos when leaving the home in a hurry. This is seen as an unlucky meeting with the Kojin deity. To get better, the person has to offer o-miki to the deity for seven days. In 松江市 Matsue town - during the construction of a mountain road, someone stepped on the 荒神様 Kojin Deity and brought a curse on the area. A landslide happened and the boss of the workers had only bad luck from then on. In some hamlets of Eastern Okayama if people feel a fever coming, they make an offering of 鰧魚 Okoze to the Hearth Deity and feel healed soon. The Hearth Deity loves Okoze and does not like any other fish. Once there was a large fire in a restaurant in front of Shinagawa station. One person grabbed the small kitchen shrine for the Kojin Deity, climbed on the roof and opened it toward the flames. Then the wind suddenly changed and the fire stopped just before the next house. Once they cut a maki no ki マキの木 / 犬槇 Podocarpus macrophyllus sacred to 荒神 the Kojin Deity and soon there was a typhus epidemy in the village. This must have been the curse of Kojin Sama.